Everybody knows and loves those big, black-and-white giant pandas, right? But there’s another panda that most people know little or nothing about. It’s the raccoon-sized red panda. Both animals are called pandas, but don’t let that fool you. The giant panda is a bear, while the red panda is in a group of its own. Red pandas have no close relatives. Red pandas and giant pandas are alike in some ways, though. Both live in cool, misty forests near the Himalaya Mountains of central Asia. And both spend a lot of time munching on a kind of tough grass called bamboo. Bamboo is a “low-energy” food and very hard to digest, and not just any animal can survive by eating it. But bamboo is plentiful where red pandas live, so they have evolved in ways that help them make the best of it. 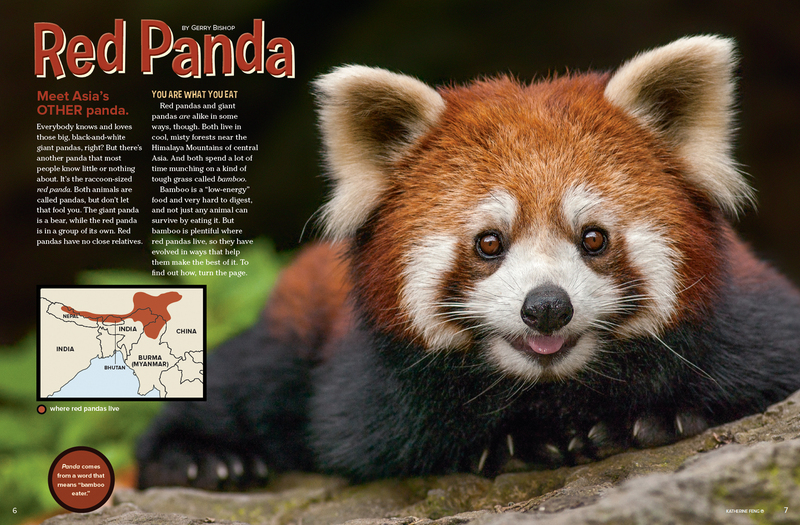 If you ever travel to red panda land, you will probably have to look up to spot one of these little creatures. Red pandas live almost full-time in the treetops. And they have the right “tools” for living there: cat-like claws for gripping bark and short, powerful legs for climbing. But, wait. If red pandas eat mostly bamboo—a kind of grass—what are they doing in the treetops? The answer is that bamboo grows very tall. And so red pandas can reach the best parts of the plant—the leaves and the tips of young shoots—by climbing trees. Because even the best parts pack very little food energy, red pandas must spend almost all of their awake-time stuffing themselves. The rest of the time, they just sleep or relax to digest the rough meals. Winters can be bitter cold where red pandas live. But the pandas have everything they need to survive that, too. Their thick, furry coats hold in almost all of the pandas’ body heat. (Snowflakes that land on them don’t melt!) And when the pandas sleep, they wrap their bushy tails around their faces to keep them warm. Even the bottoms of their paws are covered in fur! Scientists have found fossils of red pandas (or animals very much like them) in many parts of the world. But, as the world changed over millions of years, those animals died out. Today, the only red pandas still surviving are those in some mountainous forests of central Asia (see map on page 6). Even those pandas are having a tough time. The forests where they live are being cut down for lumber and farming. And some red pandas are being illegally hunted for their beautiful fur coats and tails. During the past 18 years, the number of red pandas has fallen from about 20,000 to about 10,000. But the good news is that people are helping to stop the illegal hunting and also protecting the forests that red pandas need. Wild red pandas are super shy, and they’re experts at hiding from people. That makes it hard for scientists to study them in their natural habitat. So some scientists are helping red pandas to breed and raise their babies at zoos and research centers. By studying these captive-bred pandas, scientists are learning a lot about the animals’ day-to-day needs and habits. And that knowledge could, for example, help scientists find, track, and observe wild red pandas. 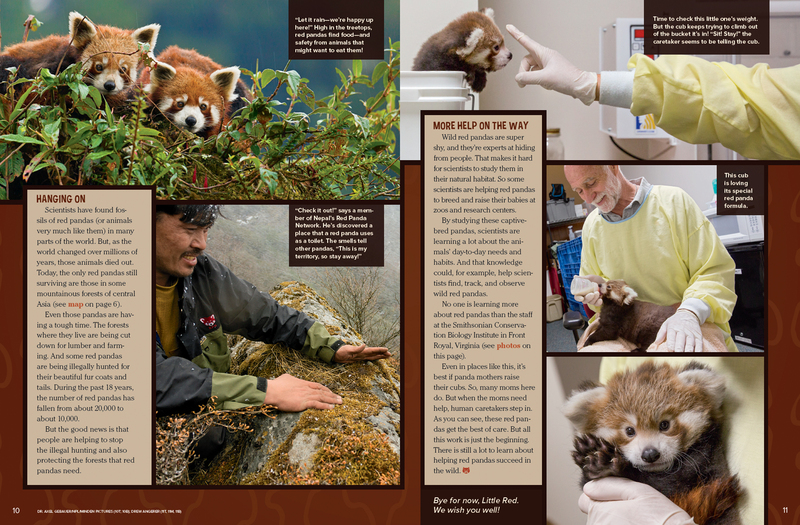 No one is learning more about red pandas than the staff at the Smithsonian Conservation Biology Institute in Front Royal, Virginia (see photos on this page). Even in places like this, it’s best if panda mothers raise their cubs. So, many moms here do. But when the moms need help, human caretakers step in. As you can see, these red pandas get the best of care. But all this work is just the beginning. There is still a lot to learn about helping red pandas succeed in the wild. Bye for now, Little Red. 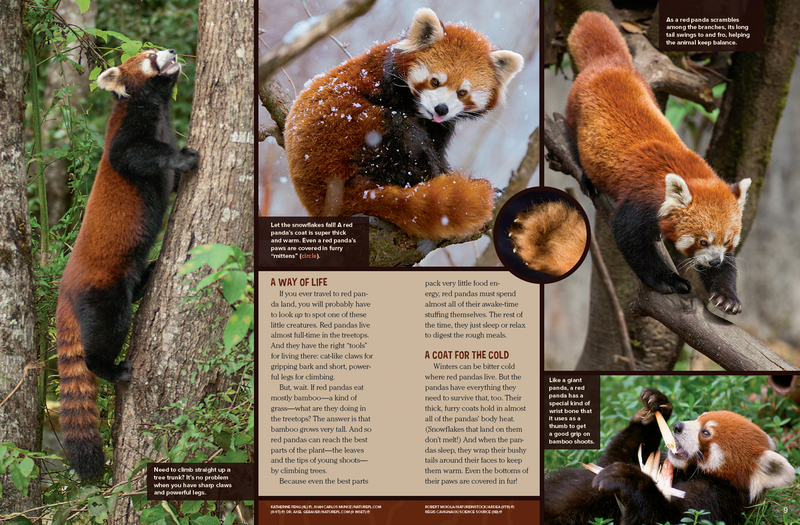 “Red Panda” originally appeared in the August 2016 issue of Ranger Rick magazine.